It has been an eventful first month as a manager for former Sunderland and Hartlepool United defender Ben Clark. Three weeks have passed since the 35-year-old was named as successor to Steve Watson at National League play-off challengers Gateshead. Clark has made a solid start to life in the dugout as his side put off-field uncertainty behind them to claim a win and two draws from their last three games. 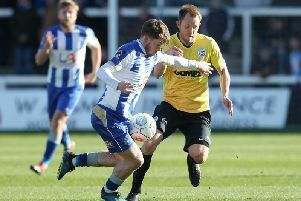 Those results have kept Gateshead in the National League’s top seven and they will be hopeful of solidifying their play-off credentials when relegation-threatened Havant and Waterlooville visit the International Stadium on Saturday. The fixture will be Gateshead’s first home game since the departures of club stalwart Mike Coulson and top goalscorer Scott Boden, who forced through a return to former club Chesterfield last week. Williamson and myself have been trying to do here. “There wasn’t much wrong here, Steve (Watson) and Micky (Cummins) were doing a great job, but we have our own ideas. “I inherited a good changing room and that’s all you can ask for as a manager. “There has been a lot of talk about the club and what has happened behind the scenes, but we can only focus on what we can control. “That means our focus is on training and matchday, nothing else matters to us at the moment and I am always happier on the training ground anyway. “Nothing has happened this week so far, which is good. A number of the Gateshead squad have been linked with moves away from the club. The rapid progress of defender Jon Mellish has caught the attention of a number of Football League clubs and captain Fraser Kerr has been linked with Hartlepool. The likes of Scott Barrow, Robbie Tinkler and Greg Olley have all caught the eye as the Heed have made a mockery of pre-season predictions of a battle against relegation. Clark confirmed that talks are underway with current members of the squad as he looks to tie them down for next season. “We have started talks with a number of the players and we have contacted them over the last few weeks,” the former defender admitted. “We would be stupid not to offer deals to these lads because they have done so well for the club this year.